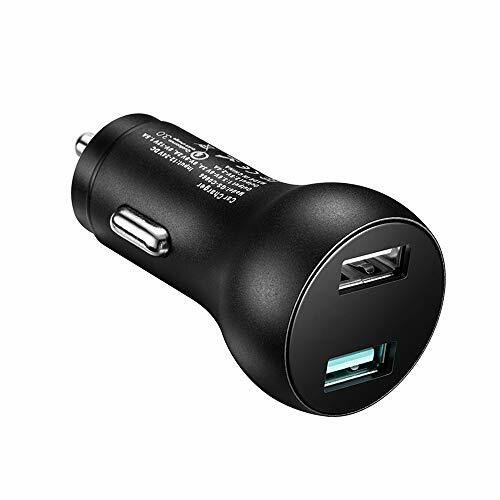 Universal Compatibility: Car Charger Adapter Works with all USB-Powered Devices Including Android & Apple Smartphones & Tablets. iPhone, Samsung, Motorola, Nexus, LG, PSP, GPS, MP3/MP4, Cameras, Bluetooth Headsets. The QC3.0 Port Output 18W, Up To 3A; Conventional Charging Port: Output 12W, 5V=2.4Amp. Total Output: 30W. The QC3.0 Charging Speed is up to 40% Faster Than Conventional Chargers. Premium Quality / Safety with FCC/CE/RHOS Certified. Compact Design: Dual USB Port Fast Car Charging with LED Light, Featuring Two USB Ports and an LED Light for After Dark. Package Include: 1x Dual Port Quick Charge Car Charger. 90 Days Money Back Guarantee and 180 Days Product Replacement.